I'm totally intrigued to see what you'll come up with. 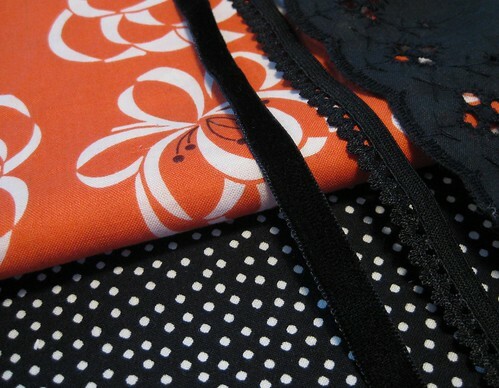 I love the fabrics, especially the orange. The print is fun w/o being too Hawaiian, you know? Is the first trim velvet ribbon? I'm busting out the machines tomorrow so I can finish my Evan's quilt before school starts next week. Astrid - funny you should say that, just today she posted that people should not feel like they need to do it every week!! You should join in! Misc - yep, velvet ribbon. You may have noticed it all over everything I sew these days...I don't know how I became so enamored! Good luck on the quilt!! OoooOooOo! thats gonna be cute, whatever it is! Ooooh! I like it! I never use trim... I always mean to, but it just hardly ever happens. I love some ricrack, though, and I think it just looks fabulous on all sorts of little girlie things. I'm trying to force myself to put a ruffle or two on an Insa, but it's not coming naturally to me LOL!